My DE32 came in the mail today. According to the foil decal on the bottom left front of the speaker, it is a DSP radio. Also, it was advertised by the seller on eBay (bigbargainonline) as such. The radio uses a rechargeable 3.7 V 800 mAh Li-ion battery and comes with a standard USB-A to Micro-B charging cable. It also comes with stereo in-the-ear earphones. The manual is in Chinese. 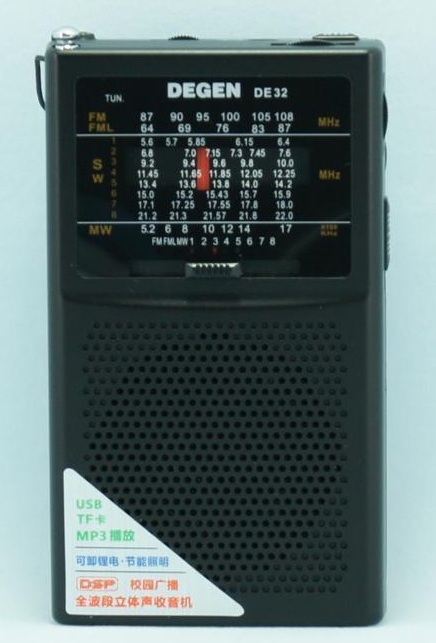 According to the dimensions in the manual, the radio is 110 x 62 x 23 mm in size. The antenna extends straight out of the top of the radio and does not swivel. The tuning knob is a thumbwheel that is accessible from either the top of the radio or from the right side of the radio. The on/off switch is a three-position slide switch (OFF/MP3/RADIO). The sound is not as pleasant as the DE 321. Also, I noticed that the FM signal strength dropped significantly when I placed the DE 32 on the table by itself. When I picked the radio back up, the signal strength picked back up – and this was on a local station. I have not tested the MP3 playback yet. Yes, it has a light. It is on when charging and then brighter when you push the button on the side. It uses a micro SD card and you can play music files from it. I took just a minute to compare it with the Degen 321. Performance is similar, but the 32 is much lighter, and feels less substantial. The 32 speaker plays loud, but is a bit tinnier to my ear than the 321. To clarify. The light is a flashlight. It does not illuminate the tuning scale. MP3 player but no MP3 recording though? Just playback of your own files? Seems really odd! But it does appear to have a built in light?